Yogacharya met Paramahansa Yogananda for the first time when he was in his late thirties, Probably sometime between 1930 and 1933. He never was more specific than that as far as I know. He was often asked to relate the circumstances of his first meeting with Yogananda and most of the time he would comply. This story is related on a few of the fellowship tapes and on the video tapes offered for sale by Golden Lotus, Inc & Song of the Morning Ranch. I think it is probably worth retelling here. Yogananda was traveling by airplane from the east coast back to Mother Center in Los Angeles, CA. Before beginning his trip divine mother directed him to fly to Detroit. 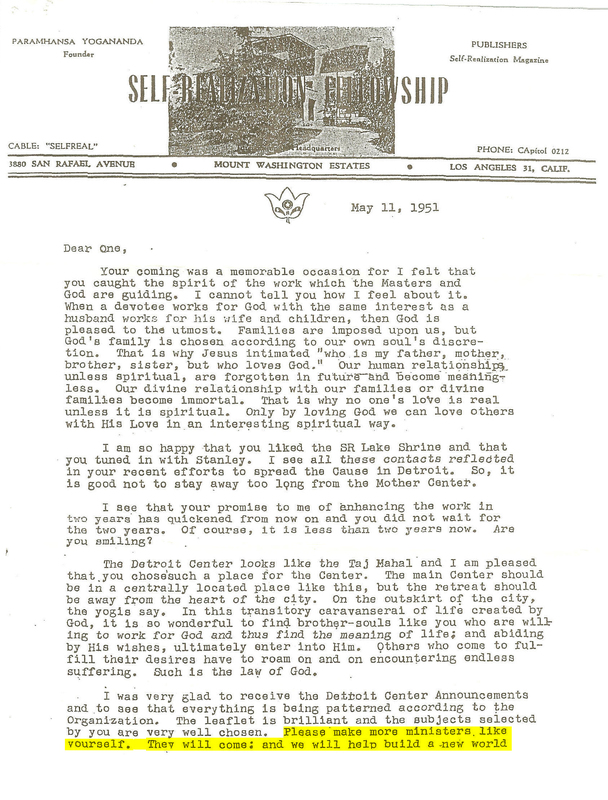 Although Yogananda didn’t know why he was going to Detroit he obeyed Divine Mothers direction. Upon arriving in Detroit he still didn’t know why he was there so he found a phone book and began running his finger down the pages until directed to stop. The name in the phone book happened to be a woman named Maude Emerson. Yogananda called her and introduced himself. She said a man taught a Yoga & Philosophy class in her home. Yogananda said he had to meet this man. Of course, that man was Yogacharya J. Oliver Black. When they met Yogacharya said that Yogananda was ‘Instantly & Anciently Familiar’. Yogacharya related that they spent the next two weeks together at the Book Cadillac Hotel in downtown Detroit, where he taught Yogacharya many Yogic healing Techniques among other things. It was always with great attention and joy that we woud listen to Yogacharya relate experiences he had with Yogananda, James Lynn, & Dr. Lewis. He related one occasion when he was visiting Yogananda, he said he was staying in a room at the Encinitas retreat. 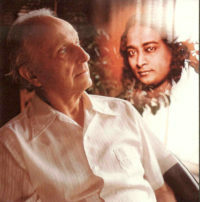 Yogacharya was browsing around the room, looking here and there when Yogananda called him on the phone and chastised him saying ‘I put you in there to meditate’. 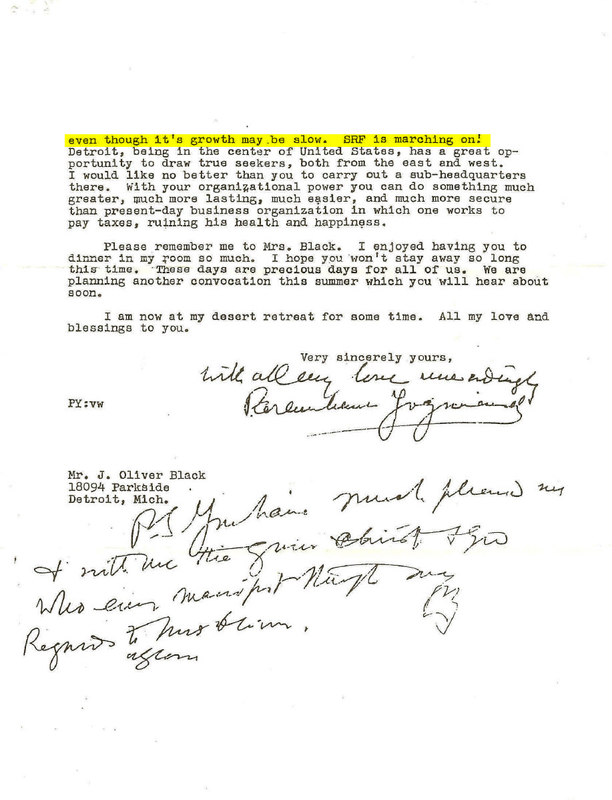 Immediately Yogacharya began to meditate and while he was meditating deeply Yogananda slipped into the room unnoticed and sat next to Mr. Black. Yogananda pressed his body right up to Yogacharya’s and began to shoot energy from Yogananda’s Chakras through to Yogacharya’s Chakras. Yogacharya said there was a period of about 3 years when Yogananda and other masters, would appear astrally in his meditation room nearly every night to teach him and help him in his meditations. In his humility Mr. Black always said that he was a little yogi and Paramahansa was a big yogi and compared him to a giant cobra that could swallow a frog (Yogacharya) one gulp. He often told of a time when Paramahansa Yogananda asked him ‘Oliver, do you Pray?’ Yogacharya answered ‘Yes master I think I pray nearly all the time.’ Yogananda said ‘The next time you pray pray in God not to God.’ Yogacharya said this had a most dramatic effect on the way he prayed from then on. Yogacharya often spoke of an experience he had at Mt Washington during an eight hour Christmas meditation. The following is how he related it at a Christmas meditation at the Detroit Institute of Arts in 1968.